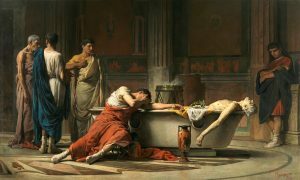 Tres amici finem imaginis Senecae mortui tractandae faciunt. Quid censes de variis tabulae pictae elementis, velut de pariete, de amphora, necnon de compositione totius tabulae? Certiores nos facias aut hac in pagina (infra) aut apud Prosopobiblion (“Facebook“) aut pipiando (“tweeting”) @QDicitur–adice #QDPod130. Quomodo Dicitur? Podcast: Episode 130 by Justin Slocum Bailey, Gus Grissom, Catherine Reed, and Jason Slanga is licensed under a Creative Commons Attribution-ShareAlike 4.0 International License.